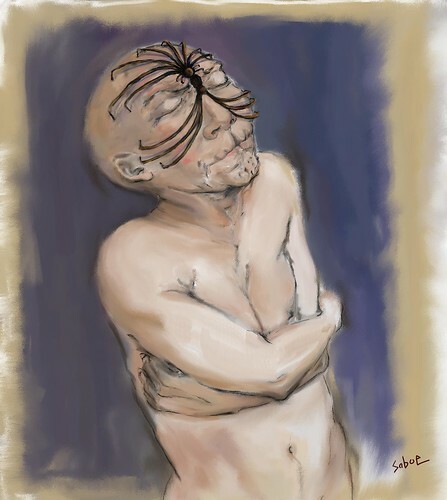 This entry was posted on Tuesday, August 12th, 2008 at 7:43 pm	and tagged with art, corel painter x, digital art, migraine, painting and posted in Uncategorized. You can follow any responses to this entry through the RSS 2.0 feed. Wow! Wonderful art regardless if for such a painful subject! I had a lot of those over the years until I cut a most of the sugar and caffeine out of my diet. Then they all but went away. Oddly…a single square of unsweetened baker’s chocolate helped quite a bit at times. Don’t get up on LJ often but happened to drop in at a lucky time and caught your migraine image. Wow!! Brilliant and dead on! Your work is fantastic. I ran across one of your pieces on the interweb and recognized it as one of yours by the feet (one of your barefooted crone pictures). You draw beautiful and distinctive feet. thank you. and my feeties thank you too! I’m so glad you both agreed!! Well, I’m not going to do this right now, but I’m really looking forward to it. At first, I need to look around a little, pick the best parlour… Of course, I will let you know as soon as I have it done! I hope it will happen fast, but if not at the moment, then at least in a few months. I live in Poland, my name’s Maja- the reason why I chose coyote is because ‘mai’ is native american ‘coyote’. I find it marvelous, that I’ve found your drawing, I must be lucky!^^ And you’re an Artist 🙂 Thanks a lot! I’ve found your drawing of a coyote, while looking for a coyote tattoo and I think it’s.. PERFECT. I want to have a tattoo made and I’ve fallen in love with that drawing, I would really love to use it. I just esteem you as a person and you work, too and I don’t know if Brni has used it , so I decide to ask you… Would you mind if a girl somewhere in the world would hold that coyote drawing on her skin? Hi. I’m very flattered by your request. I asked Brni and he said it would be okay for you to use the coyote for your tattoo. Would you mind telling me who you are and when you have it done, some pictures to show us? This is so good! You did this? yes, i did it today from a little doodly-sketch. Your image is so dead-on that it brought me tears. I suffered one of mine earlier today. Thank you. I’ve grown used to them but it doesn’t make it any better. I have gotten them less frequently with some weight loss and not smoking. That’s interesting you posted this. Scientific American ran a drawing of what a migraine looked like to sufferers and it was very black and angular. wow…thanks for the link. migraine art!